Napoleon once said that luck was the greatest attribute of the victorious general. The same could be said about the successful archaeologist. While archaeologists can make informed decisions about where to dig, some finds are purely accidental. In one such case, corroborating evidence of Hezekiah’s reforms was found in the form of an ancient toilet seat. During the eighth century B.C., Hezekiah refurbished the Temple in Jerusalem and removed elements of pagan worship throughout the land. The text states, “he removed the high places, broke down the pillars, and cut down the sacred pole” (2 Kings 18:4; cf. vs. 22). Additional evidence of these reforms can be found in the abolishment of a temple at Arad and the destruction of a horned altar at Beersheba,1 as the existence of both violated the Mosaic Law (Deuteronomy 12:1-7; Exodus 20:25). Another product of these reforms can be found in a desecrated gate-shrine at the city of Lachish. Inside one of the chambers of the gate stood a shrine. This area was divided into two small rooms, one of which contained two horned altars desecrated before the Assyrian siege of the city cir. 701 B.C. Most of the altars’ horns—horn-like protrusions at each of the four corners—were cut off, rendering them ceremonially useless (cf. Amos 3:14). Inside a second room, identified as the “holy of holies,” excavators discovered a square stone measuring 20 x 20 inches in size, with a hole in the middle. Fashioned into the shape of a seat, this is easily identified as an ancient toilet (other examples of such seats have been found in Israel and Jordan). Lab tests indicate that the stone toilet in Lachish was never actually used by any of the city’s inhabitants. Even though the placement of the toilet seat was symbolic, its inclusion desecrated the shrine. Defiling a sacred space by turning it into a latrine is known from the Bible. Jehu desecrated a temple of Baal in this fashion during his time as king of Israel. The text states, “they demolished the pillar of Baal, and destroyed the temple of Baal, and made it a latrine to this day” (2 Kings 10:27). The desecration of the shrine offers important information about the worship taking place at Lachish at the end of the eighth century B.C. 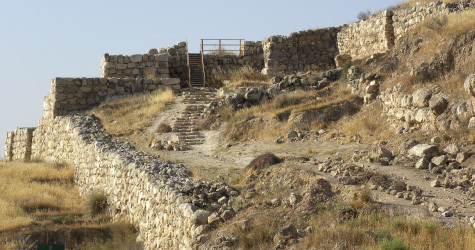 Residents of Lachish—and the king in Jerusalem—were taking the worship of God seriously. They seem to have been following Mosaic prescriptions by eliminating competing places of worship outside of Jerusalem, such as those at Lachish, Arad, and Beersheba. Having a centralized place of worship would have been of little concern to Israel’s pagan neighbors, who worshipped their gods at a multiplicity of sites. However, this does point to the uniqueness of Israel’s worship of God and her unwillingness to tolerate alternative forms of worship that controverted the stipulations made in the Mosaic Law. Often it is said that truth is stranger than fiction. As odd as it may seem, it appears that evidence of a renewed dedication to the worship of God during the reign of Hezekiah has been found in an ancient toilet. 1 David Rafael Moulis (2017), “Hezekiah’s Religious Reform—In the Bible and Archaeology,” Bible History Daily, https://www.biblicalarchaeology.org/daily/ancient-cultures/ancient-israel/hezekiah-religious-reform-in-the-bible-and-archaeology/. 2 Saar Ganor and Igor Kreimerman (2017), “Going to the Bathroom at Lachish,” Biblical Archaeology Review, 43:58-59, November-December. See Isaiah 36-37.